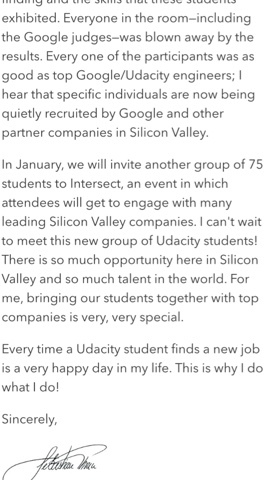 Udacity's founder Sebastian Thrun proudly announced that Google has paid for Udacity students to fly-in to visit the Google campus and attend mini hackathons and semi career fairs. 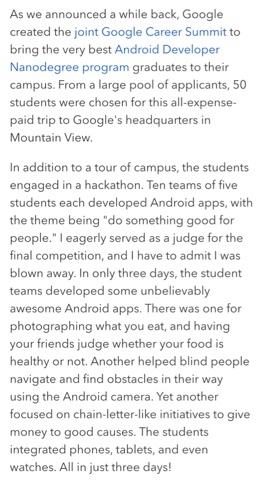 Udacity is careful to give false hope by carefully wording the letter stating thatSebastian and other hackathons judges were impressed with the progress of their students, some students are rumored to be courted by Google and partner companies. Udacity clearly has Google behind its back, given that its newest Android Development Nanodegree was announced at the Google I/O 2015 given face time in front of all Google fans. However, prospective students of the Udacity Android Development Nanodegree program still has to take everything with a grain of salt. After all, learning to code is only the first step. Becoming a Google-worthy developer takes talent, hard work, and maybe a lot of experiences. 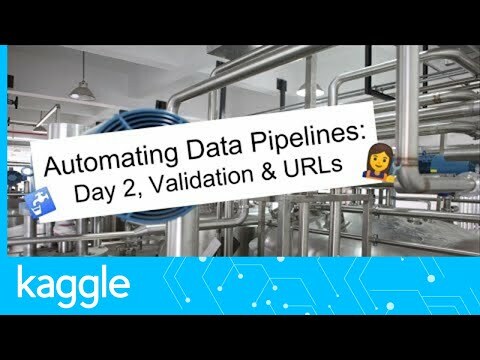 This being said, if your ultimate goal is to work for Google, may be you should check out these Udacity courses. If you are just learning Android development for the sake of learning to program, may be Couriers courses are much better and affordable (Udacity's $200/month versus Coursera 's $49-$79 for an entire course). I will let you judge for yourself, please see a screenshot of the email below and links to the two Udacity landing pages mentioned.